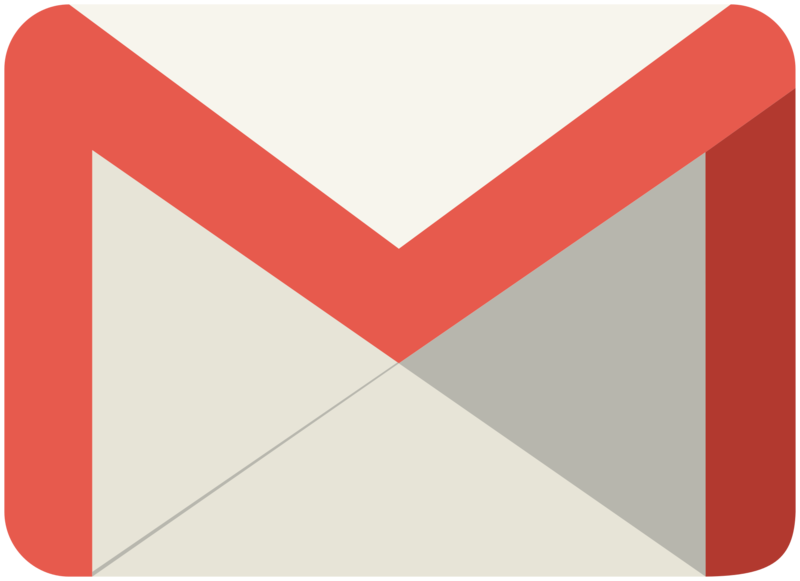 Google in the coming weeks will be launching an Early Adopter Program (EAP) for a new version of Gmail. 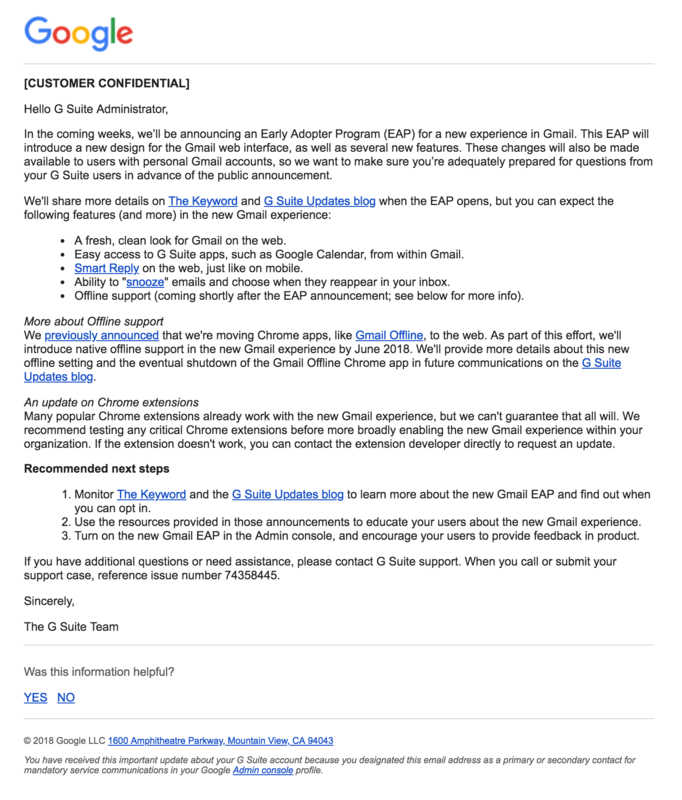 In a memo sent to G Suite Administrators recently obtained by TechCrunch, Google says the EAP will introduce a new design for the Gmail web interface as well as several new features. Google’s memo says users can expect a fresh, clean look for Gmail on the web plus easy access to G Suite apps like Google Calendar from within the platform, the integration of Smart Reply (just like on mobile) and the ability to snooze e-mails and decide when they reappear in your inbox. The search giant promised to share more information about the new design on the G Suite Updates blog and The Keyword once the EAP opens. Offline support is also in the works, the message states, although it’ll arrive “shortly” after the EAP announcement (by June 2018, we’re told). Worth noting is the possibility that some popular Chrome extensions won’t work with the new Gmail experience. As such, Google suggests testing any critical Chrome extensions before broadly enabling the new Gmail experience within organizations. Should an extension not play nicely with the new Gmail, Google recommends checking with the extension’s developer to request an update. 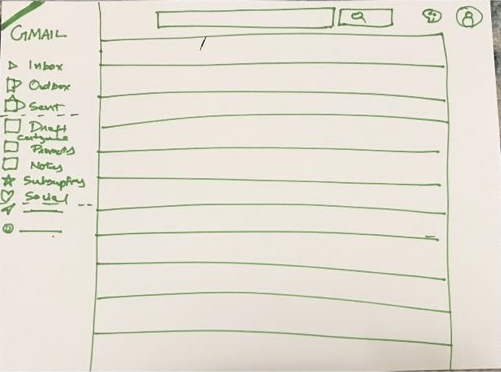 After reading TechCrunch’s story, a Twitter user reached out and provided the publication with the sketch shown above after reportedly seeing a Google employee playing with the new design on public transport. He described it as a hybrid of Gmail and Inbox. Look for the new Gmail experience to debut in the coming weeks. I'm sure I'll hate it but eventually get used to it. mbrowne5061 and OutlawCecil like this. The LOGO shown is that of the Gmail App for mobile devices, while browser access remains unaffected. 1.) The ability for users to create folders to help organize their messages. That "labels" concept just doesn't get the job done. 2.) The ability for users to quickly and easily tell GMail to sort their messages by date, subject, sender, etc.